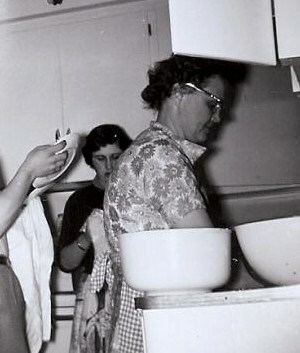 My Grandma in her kitchen. For the first five years of my life, my family lived in the same farm yard as my Grandma & Grandpa Pitura. I spent many hours with my Grandma and have so many fond memories - one of which is making pierogi. I used to beg her to make them, not only because I liked eating them, but also because my Grandma was so patient and took the time to teach me and show me and help me, and it was something we did together. Pierogi are also a staple in our traditional Polish twelve course, meatless meal on Christmas Eve called Wigilia. So I made my batch yesterday... it was particularly sentimental for me this year as my 94 year old Grandma's health is failing, and I'll also be taking some to my Dad in his care home as he suffered a debilitating stroke this year. The joy is that I made these pierogi with my baby girl watching intently from her high chair. I know her little fingers will someday pinch a pierogi or two! Now a note about the recipe. There is no recipe. It is by feel, there are few measurements. The method is learned and the pinching comes with practice. However, I have done my best to document how my Grandma taught me and most of the instructions are precisely her words. These are the potato pierogi, but my Grandma would also make sauerkraut, and sometimes jam or blueberry pierogi. - Peel and cut potatoes. I use a combination of red and white potatoes, which I find give a good consistency. Not too dry, not too wet. Fill the pot half way up, about 10-12 potatoes. Boil, drain then mash. Set aside to cool. - Saute onions in margarine and add dill. Add salt and pepper. Saute until onions become soft and clear. 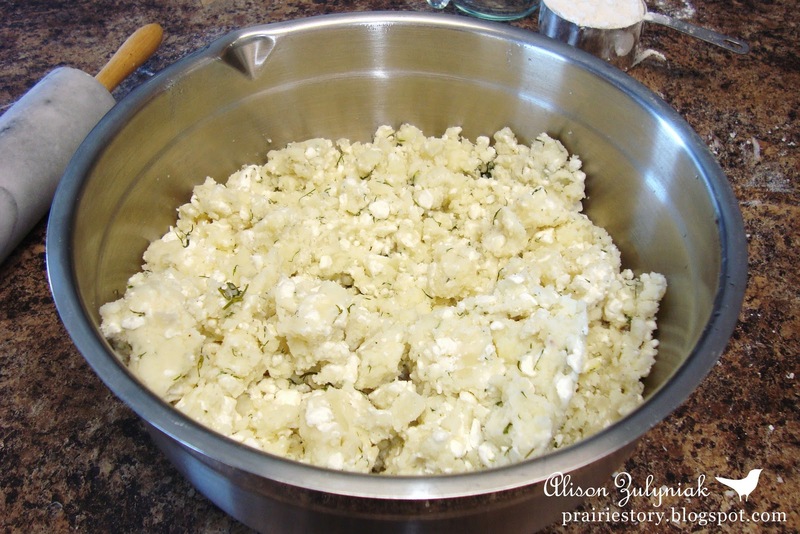 - In a large mixing bowl add onion dill mixture to mashed potatoes. - Add cheese to cooled potatoes - not hot! Remember to crumble cheese. - Taste. Add additional salt and pepper if needed. Note: I usually make the filling the night before and refrigerate. - Combine dry and margarine. Use your hands until there are no chunks of margarine left. - Add water. Knead until dough doesn't stick to your hands. - Cut (into quarters), cover and lest rest for 10-15 minutes. - The dough is better and easier to handle if on softer side. - Get filling out. I find best if it is at room temperature. If filling is not sticky enough add some oil or margarine to it. I then tamp it down in the down which makes it easier to scoop out with my kitchen scoop. 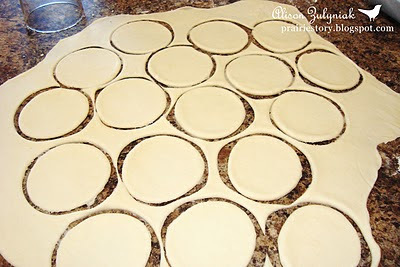 - Roll dough and cut into circles. I only use flour on my rolling pin, not the surface because if the dough is the right consistency it won't stick to the surface. Use metal mason lid or glass to cut. - Take a circle and give it a roll. - Flip the circle into your had sticky side (the downside up). - Put a scoop (about a tablespoon) of filling inside. 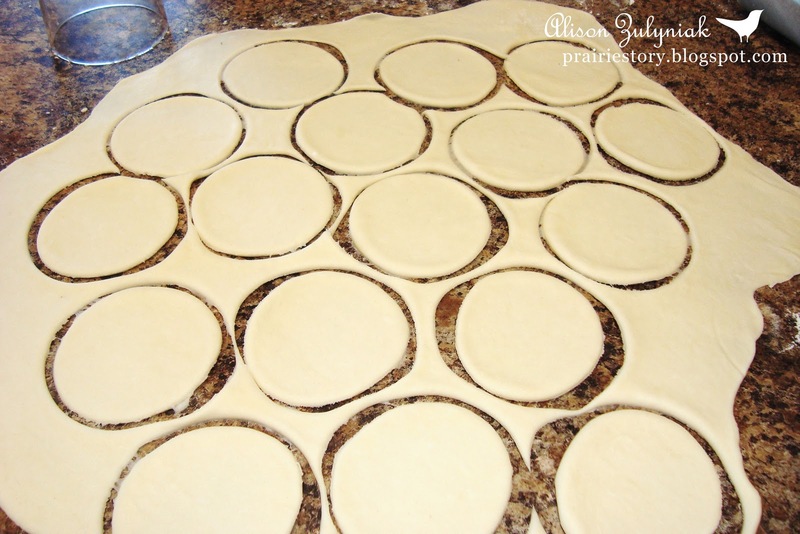 - Fold the circle in half and pinch dough together to form half circle. 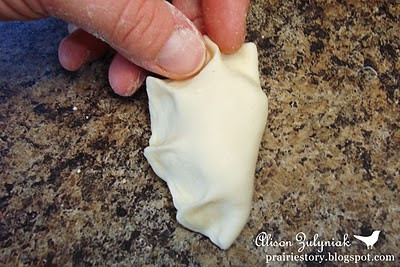 - Then pinch again by pushing dough up with your middle finger, then pinching with your index and thumb. This gives the pierogi a good seal to ensure they don't boil apart. - Place pierogi out on tea towels, cover so they don't dry out. Note: My grandma would save the scrap dough and reroll to make more. - Set up for boiling with large pot of boiling water, melted margarine, strainer to drain off excess water, large bowl to coat pierogi in margarine that will prevent sticking, and a casserole dish. Perhaps a little elaborate, but this makes it easy. 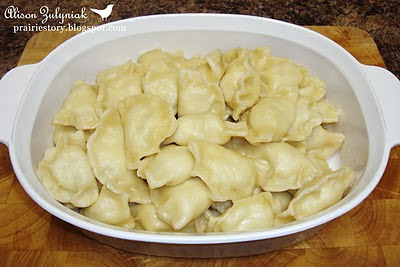 - Add pierogi 15-20 to water when boiling. I add a little oil to the water to prevent sticking. 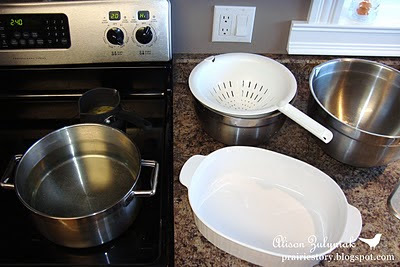 - Bring water to boil again, then turn down heat a notch or two. You don't want to boil apart the pierogi. Cook for 4 minutes until the all float to the top. - Drain and coat with margarine. I usually place them in a large casserole, let cool, then refrigerate or freeze. Then when we are ready to eat them, I warm in oven. It goes without saying to serve with sour cream and sauteed onion or bacon if you like! YUM! I love stories about the connections between food & family. And your pierogies are picture perfect! Thanks for sharing your memories and your Grandma's recipe. My Granny's perogie recipe is with sharp cheddar cheese. Funny that the sisters ended up making different kinds. How fun to continue a family holiday tradition! I lived in Toronto for awhile, and all of my Canadian friends raved about pierogies :) Happy holidays! 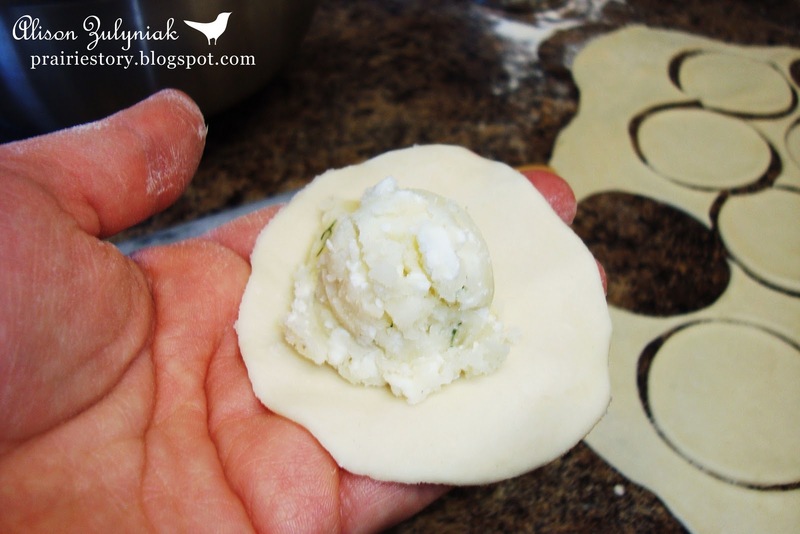 I never had pierogi until I met my Canadian husband, and I've never had them homemade. I bet they are amazing! Oh, and thanks so much for the shout-out on the Eggnog Snickerdoodles. Have a wonderful Christmas! I just discovered your website and thoroughly enjoyed reading about the pierogies. My mother never had a written recipe and I finally made her stop after each step and measured and wrote down the ingredients and amounts. Over the years, I've developed my own version of dough that works really well for me. 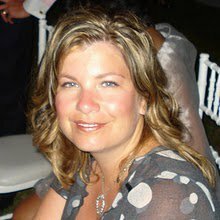 My daughter-in-law learned how to make them the first time she visited us when she and our son were just dating. She makes wonderful pierogi now. In fact, our grandson always asks his mom and I to make them for him. Its his very favorite meal. He and his dad will then see who can eat the most at dinner. Priceless. Reading your recipe brought so many memories flooding back, especially many hours spent with my mother making the pierogi for a holiday or special event. Thank you. I used your dough recipe, it was my first time doing pierogi's. I used my own filling of potato, crawfish, spring onions, and roasted garlic. I halfed the recipe and ended up putting half of THAT in the freezer, I look forward to trying new fillings with that.